Lockers are being used more and more in the school environment. In primary schools they help to keep the children's belongings separate and tidy, and to teach the pupils how to take responsibility for their own things. In secondary and high schools, lockers are more secure and allow students to store their belongings safely. They also provide privacy to students during a sensitive time in their lives. Many primary schools are now replacing their coat pegs with lockers, primarily to save space and improve the image of the school. Coat pegs can look fairly untidy to visitors. Primary school lockers tend to be only around 1.3 metres in height so that school children can easily access them. They are usually coated with an antibacterial finish to help to combat the many bugs that primary school children swap between themselves. 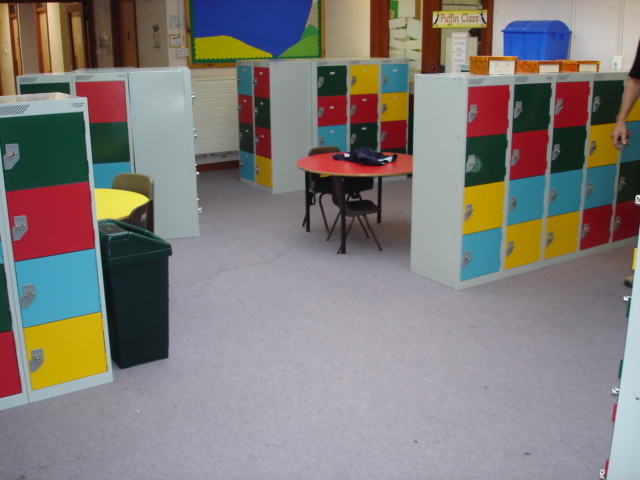 Lockers intended for use by small children are often available in a range of bright colours, which allows them to fit in with the style of most primary schools, where a bank of grey lockers would look out of place. Schools can also choose to colour code their lockers, so that reception pupils may have yellow lockers, year one pupils may have red ones and so on through the year groups. This makes it easier for the children to find their own lockers in areas where several year groups share a space and also brings some colour to the school. Most primary school lockers come with a cylinder lock and two keys, but keys are usually only issued to the older pupils. Perforated or transparent lockers are particularly well suited to primary schools because the children can more easily identify their own locker if they can see their own belongings inside. However, it does also allow them to see what other children have in their space which can tempt them to enter lockers other than their own. Many primary schools purchase open lockers (those without doors) for their pupils so that they can more easily access their belongings. Most primary schools have strict rules concerning what can be brought into school so there shouldn't be anything of any value in a primary school locker. This means that security is not so much of an issue, and lockers are used more to keep belongings tidy and clean, as well as to teach children the value of having their own personal space, and the responsibility that it entails. For pupils in the last year of primary school, security and privacy are more important so it becomes more important that they can lock their lockers and that no one can see inside them. Lockers for older children need to be more secure than those in primary schools because they could contain mobile phones, money, medication or personal items. Sturdier lockers tend to be used and keys are issued to all pupils who are issued a locker. In schools that are experiencing problems with lots of contraband items being brought into school, which can range from iPads, to cigarettes and alcohol, right up to drugs and knives, transparent lockers may be installed. This sacrifices the privacy of students but is often deemed necessary. A spare key is kept by the school so that they can replace lost keys or access lockers if they suspect that there's something in there that shouldn't be. Secondary school students will regularly lose their locker keys and having new keys cut can get very expensive. For this reason, many schools offer to pay for one replacement key but will charge pupils for all additional keys required. This helps to reduce the cost to the school and also encourages students to better look after their keys. A large group of students all accessing their lockers simultaneously can make a huge amount of noise. For this reason, many schools opt for special quiet lockers. They tend to made from steel and to be fitted with rubber door linings, quiet latches and door stiffeners to reduce the volume generated by opening and closing locker doors, and minimise the disturbance to other pupils in the school. To get more information about galvanised steel shelves visit our website. Proper storage and shelving facilities are always important for an organization to keep their products in an organized way. For this, they should make use of the best quality lockers which not only provide convenience to the employees but also give additional security. In schools, they are very important as students cannot carry their entire bag with them when they are working out in a gym or carry the whole bag filled with books from one class to another. Lockers give students the convenience to have every important thing around and yet not carry much in their hand. Besides lockers, one can also purchase l DigitalBuyer is an office products retailer specializing in fireproof file cabinets & safes, office furniture, industrial materials handling, office equipment, and commercial products. Locker stands online at best prices. These stands allow in easy and effective cleaning under the lockers. DigitalBuyer http://www.goodsearch.com/digitalbuyer-com/coupons is an office products retailer specializing in fireproof file cabinets & safes, office furniture, industrial materials handling, office equipment, and commercial products. They maintain wide range on lockers for school also of different brands, best quality, and affordable price such as. • Single Tier Steel Lockers: are the most popular general purpose locker for locations that need to securely store coats and clothing. • Double Tier Steel Lockers: feature two openings per locker, allowing twice as many lockers in the same space while providing plenty of storage space. • Triple Tier Steel Lockers: feature three openings per locker, allowing three times as many individual lockers in the same space while providing plenty of storage space. • Air Ventilated Steel Lockers: are designed with ventilation slots to ensure continuous airflow from all sides of the locker. This reduces the opportunity for odor causing-bacteria to grow and thrive in damp environments. • Cube Metal Lockers: are ideal for securely storing smaller items like purses, lunches and books. Efficient configurations give the necessary storage needed without taking up valuable floor space.